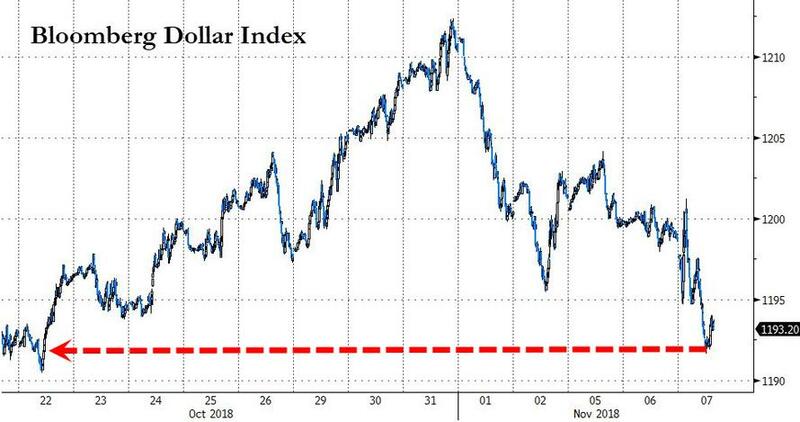 However, as Bloomberg macro strategist Mark Cudmore notes, there will be sufficient ripple effects to build a narrative that traders can allocate risk to, that’s not good for the greenback, especially if that tallies with a fundamental argument that was already gaining traction. The Bloomberg Dollar Spot Index topped out Oct. 31 before falling sharply Nov. 1. It’s almost 2% below that peak but it already looks likely that high may not be tested again this year. The data over those two days presented a clear picture of declining economic confidence. Whether it was the Chicago or Markit PMIs or the ISM indicator, all three dropped more than forecast. The subsequent wages data helped U.S. yields rise but that’s no longer supportive for the dollar when it’s perceived to be occurring amid a deteriorating growth outlook. Wage inflation squeezing corporate margins just as borrowing costs climb is a classic late-cycle dynamic that warrants elevated volatility for equities even if the bull market isn’t over yet. Combined with concerns about the U.S. twin deficits -- annualized debt costs surged again in October -- higher U.S. yields have the potential to soon be seen as an outright negative for the dollar. The pillars for U.S. equity and dollar outperformance are being eroded rapidly and the midterm results feed that narrative. Suddenly, the looming threat of a government shutdown in early December looks both more real and more negative with the Democrats winning control of the House. The slim chances of further fiscal stimulus to boost U.S. assets and potential dollar repatriation have vanished entirely, while some commentators fear greater volatility from acrimonious Trump tweets triggered by a divided Congress. The greenback is overvalued relative to the currencies of all 10 of its largest trading partners, according to IMF purchasing-power-parity metrics. That might soon become relevant given Trump’s isolationist approach on the world stage will now see him more isolated in domestic politics. The tail risk of fresh impetus for U.S. assets is behind us. The tail risk of a very risk-averse outcome has also been averted. The middle ground of results coming exactly as anticipated supports investor releveraging -- but that could translate into selling the dollar to buy global assets over U.S. equities. And finally, as a reminder, President Trump is not Larry Kudlow - a weaker dollar is just what he has been hoping for, so don't expect any Washington jawboning if this trend lower in the greenback accelerates.